a genus of perennial climbing or trailing herbaceous plants of the family Convolvulaceae. The leaves are cordate or sagittate; the flowers are funnelform or campanulate, white or pink, and solitary in the leaf axils. There are approximately 25 species, distributed mainly in the temperate regions of both hemispheres. The USSR has five species. C. soldanella is widespread along seacoasts, and C. sepium is widely found amid shrubbery. C. pellita (also known as C. dahuricd), which has large pink flowers, is raised as a climbing ornamental, as are several other species. baeotica 2m, Carlina graeca 1, Briza minor +, Calystegia sp. 1 Asteraceae Native Cony--a canadensis Asteraceae Native Erigeron annuus Asteraceae Native Lactuca canadensis Asteraceae Introduced Lactuca serriola Asteraceae Native Pyrrhopappus carolinianus Asteraceae Native Solidago canadensis Asteraceae Native Taraxacum officinale Brassicaceae Introduced Capsella burla pastoris Convolvulaceae Native Calystegia sepium Chenopodiaceae -- Chenopodium sp. En el Inventario Nacional de Habitats han sido cartografiados con el Codigo 543110, que reune a comunidades riparias nitrofilas de Calystegia sepium (V.
Herbazales densos dominados por Epilobium hirsutum y Mentha longifolia, y en los que son tambien abundantes otras especies megaforbicas como Urtica dioica, Lythrum salicaria, Eupatorium cannabinum y Scrophularia auriculata y especies escandentes como Solanum dulcamara, Calystegia sepium y, mas escasa, Humulus lupulus. Destaca tambien la ausencia o extrema rareza de Calystegia sepium en estas formaciones meridionales, probablemente debido a las elevadas cotas altitudinales (mas de 1. 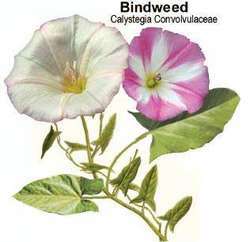 Eight species are Henry County records, including Calystegia spithamea, Carex meadii, Lysimachia lanceolata, and Symphyotrichum laeve. Thirty plant species occurring in the cemeteries that are commonly found in prairies from Illinois to Ohio include Andropogon gerardii, Anemone virginiana, Antennaria plantaginifolia, Arnoglossum atriplicifolium, Calystegia spithamea, Carex meadii, Carya tomentosa, Ceanothus amerieanus, Celastrus scandens, Cirsium discolor, Comandra umbellata, Desmodium caneseens, Elymus virginicus, Euphorbia corollata, Helianthus hirsutus, Lactuca eanadensis, Lobelia spicata, Lysimachia lanceolata, Monarda fistulosa, Rubus occidentalis, Rudbeckia hirta pulcherrima, Silphium integrifolium, Smilax lasioneura, Solidago canadensis, Symphyotrichum leave, S.